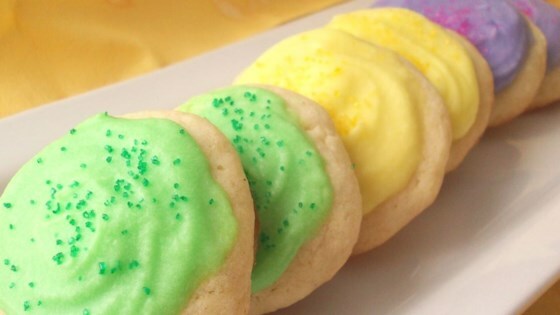 "Here's a terrific recipe for icing sugar cookies, no raw egg whites. For any recipes that require egg whites, you can purchase dried, powdered egg whites at cake-decorating supply stores that can be substituted in most recipes calling for the regular raw egg whites, then you can still lick the bowl!" Combine confectioners' sugar butter, vanilla and milk, beating until creamy. Thin with a few more drops of milk (if necessary) to reach desired spreading consistency. Stir in optional food coloring. Spread frosting over cooled cookies and decorate with colored sugar, if desired. See a fail-proof method for making perfect frosting. This recipe was fast and turned out very creamy. However, it calls for WAY too much vanilla. Half the amount is a better guess. The whole tablespoon of vanilla was too much-and without the foodcoloring, it makes brown icing. I would lessen the vanilla to a tsp., not a whole tablespoon. Great glaze for anise cut outs. Note: Please use clear vanilla extract which is available at Michael's, etc. Clear vanilla prevents the brown icing! !